It is understandable, then, that the inhabitants of the plantation take to wounded soldier Cpl. John McBurney (Colin Farrell) with a curious hesitation. Sofia Coppola’s The Beguiled is a remake of the 1971 Don Siegel film of the same name. It is a contained psycho-drama with a deliberate sense of fantasy, a fantasy that never once feels plausible and that crumbles at the seams throughout the entire film. The film is a long wait for the other foot to drop. Farrell’s polite charm, a charm strained by McBurney’s desire to survive, is the first clear signpost of tone. The atmosphere of put-on civility is so thin a veil for what is destined to happen that the entire film creeps forward with a sense of dread. But it is not a dread without emotional complications. The depth of character in the film may at first seem only inches deep, especially considering a handful of the girls in the house barely have lines to read, but the relationships between McBurney and the three eldest members of the house are quietly fascinating. Kidman plays Miss Martha with a distant coolness, restraining herself for the sake of keeping order in the house. But there is something more. A scene in which she gives a newly-mended and unconscious McBurney a sponge bath is the most compelling in the film, as it is a silent realization of Martha’s true character, her true desire for something beyond her present situation. This is the commonality which binds Martha with teacher Edwina (Kirsten Dunst) and student Alicia (Elle Fanning). All three want something that lies outside the fence of the plantation. Where Martha keeps this desire suppressed for the sake of saving face, a quality that proves to be more sinister by the end of the film, Edwina and Alicia take to their desires—manifested by the presence of McBurney, who is more of a symbol than a character as a result—in more external ways. Alicia is first seen lazily reciting French, eyes listless. She will later lazily hoe a garden in the same uninterested manner. Her cooped up existence is wearing down on her. The arrival of a man from the outside is the first thing in the film that piques her interest. Her drive may seem like a sexual one, and sexuality does certainly play a part, but it is more than merely that. Her desire is for adulthood, and McBurney represents to her the possibility of that. Edwina, played with superb understatement by Kirsten Dunst, has a similar desire. The possibility of marriage with McBurney is for Edwina a chance to get out of the isolation of the plantation, a chance to have a life of her own. Through this, Dunst’s Edwina becomes the most tragic and intriguing figure in the entire film. Coppola composes The Beguiled elegantly. The film remains stuck in the plantation and the surrounding woods. Static shots of the hazy Virginia (really Louisiana) woods create a world that is idyllic but hauntingly isolated. That the film returns to the image of the front gate, always closed, emphasizes this point. As lavish as the production design within the plantation is, that Coppola cramps the entire setting makes the colonial home seem ghastly. 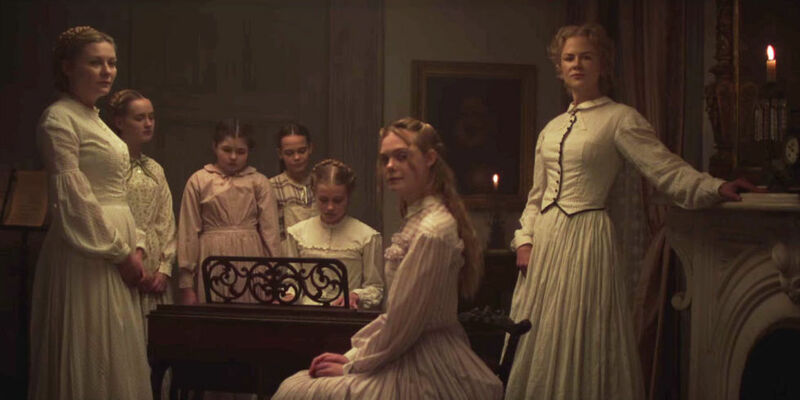 The story of The Beguiled may move a tad too quickly, characters changing opinions in a way that make them seem erratic. Despite this, the pacing of the film is a tad too slow, lingering on the situation as if to give it an added poignancy that the story itself cannot provide. But the film is attractive to look at, so much so that it becomes hard to see the film for its narrative. It is mesmerizing in this sense, even if the story cannot live up to this transfixing aesthetic.